as the new singer. Alexx is an exceptional vocalist and outstanding entertainer and has brought new life to the songs. He returned BONFIRE to The German Rock Legends as they have been known in the good old days. Alexx started to sing in his first classic Heavy Metal band in 1996. 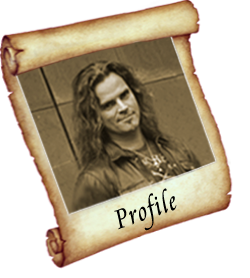 In 2001 Markus Jüllich of Crematory took notice of Alexx' exeptional talent and formed and managed the Melodic Power Metal band SEDUCTION in 2002. The band released two demo CDs before they disbanded in 2004. Out of the ruins of Seduction arose the band VIRON which released two worldwide respected Power Metal albums in 2006 and 2008. Beside Viron, Alexx and some musician friends started the world's No.1 New Wave Of British Heavy Metal Tribute Band ROXXCALIBUR in 2007. The band released 3 albums so far. In 2009 Alexx was also a founding member of Germany's only Rainbow Tribute band named BEYOND THE RAINBOW. In 2011 Alexx also joined one of the most successful German Deep Purple Tribute bands, PURPLE RISING. Beside that, Alexx was a founding member of the US Speed Metal band MASTERS OF DISGUISE who released two albums in 2013 and 2015 and also an EP in 2016. The name Alexx Stahl was highly recommended in Germany's underground Rock- and Metal scene for the last years, so it was unavoidable that BONFIRE took notice of him as the band was looking for the new voice of BONFIRE in 2016. • Favourite bands: Iron Maiden, Judas Priest, Rainbow, old Manowar, Atlantean Kodex, W.A.S.P. • My motto: "What will happen, will happen...."